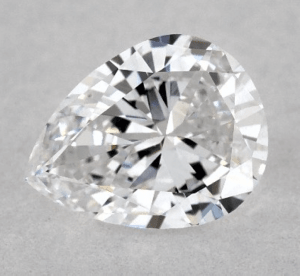 Pear Shaped Diamond Guide - Which Ratio to Avoid for Best Look? 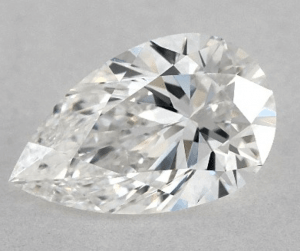 People are intrigued with pear-shaped diamonds because the cut suggests different undertones. Some see it as a tear-drop conveying the tears of joy shed for the glorious “Yes!” Others are reminded of the old era, while modern shoppers perceive it as a fusion of the traditional round and the edgy marquise. What we find fascinating about pear-shaped diamonds is the impressive brilliance coming from an asymmetrical form. The elegant cut offers the wearer an unconventional style without compromising the great sparkle. In fact, some of the most famous diamonds are pear-shaped! Let’s discover why it’s revered until today and how you can find an excellent one without breaking the bank. But first things first! 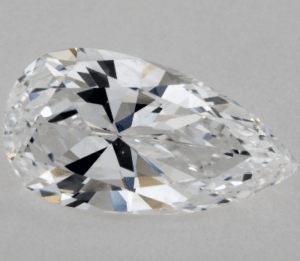 What is a Pear-Shaped Diamond? The pear shape is a modified brilliant cut with 58 facets. It is known to slenderize the finger due to its elongated cut, while wider pears are often used for pendants, and slimmer kinds are used for earrings. The unique outline brings a hint of class to the table. Those who want to explore other diamond shapes but still appreciate tradition opt for pear-shaped diamonds because it offers the best of both worlds. If your lady is drawn to this cut, then it says a lot about her adaptability to the old and new. As you know, fashion is remodeled again and again, and what may seem new in today’s craze are actually freshly branded from the past. Pear-shaped diamonds are cool now, but what some of you don’t know is its legacy goes all the way back to 1458. During this era, people are just starting to recognize the beauty of diamonds. Lodewyk Van Berquem introduced the cut and had since flourished in the jewelry industry. The renowned cutter also pioneered diamond symmetry and discovered the polishing wheel. 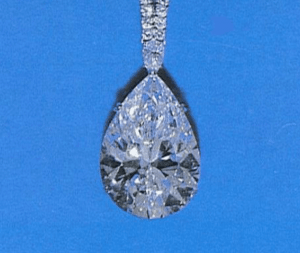 The 55.23-carat Sancy was first seen in possession of the Duke of Burgundy, Charles de Bold. He lost it on the battlefield in 1477, then it was passed onto a number of owners including Seigneur Sancy, King James I. of England, Louis XIV, Louis XV, and Louis XVI. It disappeared during the French Revolution; then housed at the Louvre since 1979. Deemed as the largest diamond on Earth, the Great Star of Africa weighs in at a whopping 530 carats! Regardless of its massive size, it’s still able to display superb color and clarity. 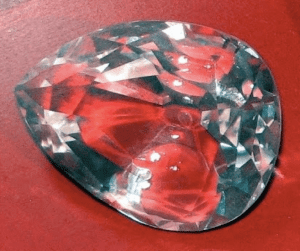 This legend was cut from the biggest rough ever found weighing at 3,106 carats. And if that’s not astounding enough, the rough is believed to be a part of a much bigger crystal! Recently discovered in 1966, the Taylor-Burton diamond is made popular by – you guessed that right – Elizabeth Taylor and Richard Burton. Cut from a 241-carat rough, the 69-carat pear is said to be the most expensive gem owned by civilians. In memory of Richard Burton who passed away in 1979, Elizabeth Taylor sold the diamond and donated the funds to a charity building a hospital in Botswana. Like other fancy shapes, GIA doesn’t provide a cut grade for pear-shaped diamonds. So, it’s important to note that the suggested parameters above aren’t based on other industry authorities but my own diamond knowledge. Pear-shaped diamonds come in a variety of makeups; there are boxier types, and there are also slimmer diamonds. That’s why you need to refer to the length to width ratio of classic pear-shaped diamonds (which is 1.40-1.70) fit for an engagement ring. The edge should be parallel to the top of the rounded end. The upper and lower curves on both sides of the diamond should form symmetrical curves. The rounded apex should look like a semi-circle. The diamond on the left is the overly elongated type. 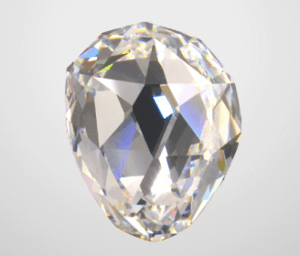 It weighs in at 1.87 and is considered too long for a pear cut diamond. On the right, it’s pretty obvious why you should miss this one; it has boxy wings taking away from the beauty of the curve. It also has a l/w ratio of 1.30 making it seem chubbier than classic pear shapes. Same as Marquise and Oval, Pear-shaped diamonds tend to show more color compared to other shapes. It’s more evident near the tip of the diamond so I would advise getting a G color or higher if you’re going with a white gold or platinum setting. For rose gold or yellow gold, you can get away with a J or K.
Then again, color is subjective. I know some women who would prefer a diamond with a warm shade, while the majority would go for the icy-white look. If you’re planning to buy a pear shape over 1 carat, you would have to get a higher grade as the color becomes darker in bigger diamonds. Unlike most fancy shapes that are prone to exhibiting inclusions, pear-shaped diamonds are great for masking flaws. This is where you can save money as you may go for as low as SI1 or even SI2 clarity. 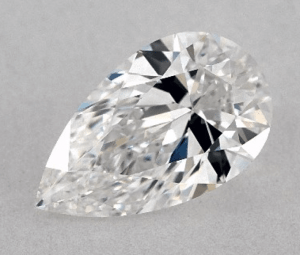 The round end of the pear shape is similar to the clarity characteristics of a round cut, but the pointed side is better at concealing imperfections. The rule of thumb, no matter which diamond shape, is to simply make sure it’s eye clean. Meaning, you don’t have to scrutinize pear-shaped diamonds with a loupe to guarantee there are no visible inclusions. If you can’t see flaws with your bare eyes, you have nothing to worry about. Unless, of course, you prefer a technically flawless diamond like an IF. I mentioned ring settings earlier regarding diamond color, but there’s more to look into when it comes to pairing pear-shaped diamonds with the right ring setting. A longer pear is best suited for dangling earrings, and a rounder shape usually goes well with a solitaire ring. If you want added diameter, opt for a halo setting. It will also emphasize the unique cut. When it comes to prongs, take note that there should always be a V-shaped prong at the tip as it’s the most susceptible to chipping. I would also recommend a 5 or 6-prong setting to protect your diamond further. Now, wearing a bow-tie implies class and opulence. But not with pear-shaped diamonds! As a matter of fact, seeing a bow-tie on this cut actually takes away from its supposed brilliance. And this is the main thing you should steer clear of! Both diamonds below possess a bow-tie effect. But the one on the left is less prominent and is better-looking than the stone on the right. 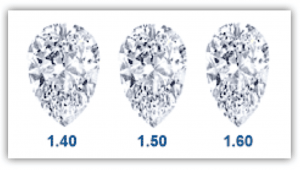 Imagine if you would only rely on a diamond certificate and not check the visual features of pear-shaped diamonds. You could possibly receive one with the undesirable effect. This is why real diamond photos are a must when shopping online. Magnified 2D images are great, but you’d also want to see the diamond from all angles. So if the website you’re browsing from offers a 360-degree video technology, then you came to the right place. Most online jewelers woo shoppers with state-of-the-art websites made for the tech-savvy generation. From advance filter tools to super zoom, they attract first-time diamond buyers like bees to honey. The thing is, not all vendors have real photos for each and every diamond. After reviewing the top online diamond stores, I found James Allen to be the most suitable when it comes to diamond display technology. The golden rule for digital shopping is to never buy blindly, and they made sure to stay on top of it by developing the right tool.